Monarch Airlines has put on extra flights to eight popular destinations due to high demand for travel to summer holiday hotspots. There will be an extra four weekly flights to Gibraltar from Luton Airport from May 27. The extra flights will be good news for many working in the tourism sector, such as travel insurance companies. The airline has also said it will put on an additional two flights per week from the Bedfordshire hub to the Spanish holiday destinations of Mallorca, Malaga and Alicante, as well as Dalaman in Turkey. An additional weekly flight from Luton to the Turkish resort of Bodrum and Faro will take off from Luton from May 27. Anyone living in the north of England thinking about getting some sun in Cyprus, will be interested in the news that there will be an extra weekly service from Manchester Airport to Larnaca on the island. 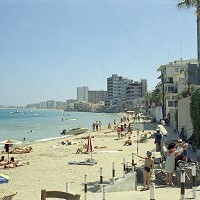 There will also be an extra 16,000 seats made available on Monarch flights from Gatwick to Malaga, Mallorca, Larnaca, Lanzarote, Faro and Alicante for the summer. Managing director of Monarch, Kevin George, said: "Bookings for summer are already up 27% compared with the same time last year with demand from customers still increasing, so we are delighted to respond to this by adding over 135,000 additional seats to our flying programme this summer season."